Sometimes your love for a place comes on as hard and fast as food-poisoning. Other times, a place is forgettably bland, bringing on neither bitter aversion or the sweet desire to return. Then there are places of which you can’t wait to wash your hands, where no matter how hard you try, you feel utterly out of sync. 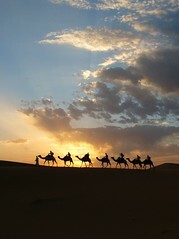 Before we left on our round-the-world trip, more than a few people asked me and Todd, “Why Morocco?” During our time in this North African country, we’ve often asked the same question of ourselves. 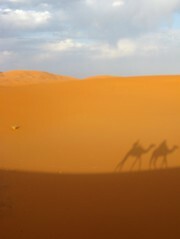 We finally synced with Morocco in the Erg Chebbi dunes of the Sahara desert near Merzouga, a place that reminded us that we are on an adventure, even if it’s sold as a package tour. What I will instead try to take with me from Morocco is something that can’t be scribbled into my pocket-sized Moleskine or captured in pixels by my camera. It’s the sudden knowing of the age of the Earth when I’m confronted by geological oddity and grandeur. It’s how the desert air greedily wicks the sparse moisture from my teeth as I smile, involuntarily, at the sunset. It’s the sensation of walking barefoot on still-warm sand as I climb a steep dune to get a little closer to the midnight moon. 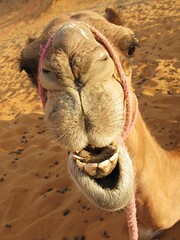 Love those jumping photos… and that camel’s gritty smirk!